I am a pancake fiend. You may have seen quite a few of my other recipes. 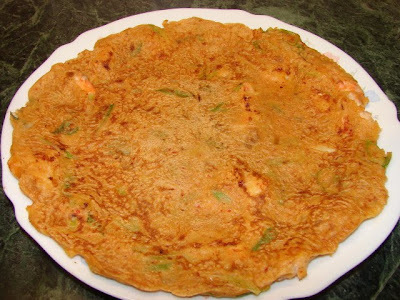 Here is another pancake recipe with kimchi and prawn. Yummy as a snack or light lunch with some salad. chopped spring onion and sesame seeds. If using homemade kimchi better use old kimchi for better flavour. Roughly chopped. Slice spring onion diagonally into 1 inch strips. If prawns are large cut into smaller pieces. Mix flour with milk/water and egg to form a batter, add in kimchi with some of the juice about 2 - 3 tbsp. Then add spring onion. Have a taste if not salty enough add a pinch of salt. Then add prawns and a dash of sesame oil. Let the mixture rest for about 15 minutes. If the mixture looks a bit thick add a bit more milk or water. You can make mini pancakes or large one like I did. For this mixture, I made 2 dinner plate size pancakes with a 30cm frying pan. Heat the pan till hot, brush with oil then add batter, spread it out evenly, let this set and brown then flip over. For large pancake once the underside is done, slide the pancake onto a plate, brush the pan with more oil and flip the pancake back into the pan to brown the other side. When done slide onto a plate or chopping board for cutting. Cut large pancake into wedges or squares. 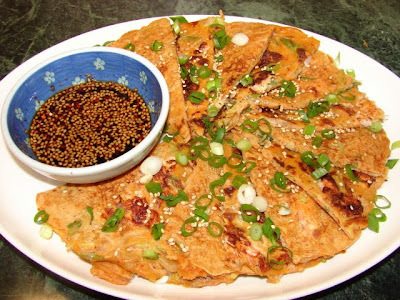 Serve pancake with dipping sauce. A mixture of Japanese/Korean soy, some Japanese rice vinegar mix with enough sugar to taste. Dilute with a little water and sprinkle with a pinch of Korean coarse chilli powder (or any other chilli powder) and some dry roasted sesame seeds.